Celebrating 10 years of Edublog awards! 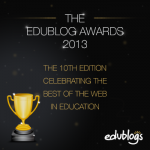 The Edublog Awards are here and it represents a decade of celebrating educational blogs. Why are the awards important? Because in the days when we used to have to fight to have blogs even allowed in our schools, Edublogs was there, encouraging us to write. And now students and teachers and librarians are blogging and celebrating sharing their work and ideas, and Edublogs has helped nurture that community. 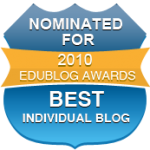 So thanks, Edublogs! Best individual blog –Buffy Hamilton– The Unquiet Librarian–Buffy’s work delves deeply into issues concerning librarians and teachers, and she has been a leader in sharing best practices with others in a deep and reflective way. Best class blog–Lisa Carnazzo’s class website — At Tech Forum, I heard Lisa’s first grader’s share how they are using Twitter and technology in their classroom–quite an inspiration. Best individual tweeter — Kathy Ishizuka — constantly shares resources for librarians, edtech links, and more. Best open PD / unconference / webinar series — TL Virtual Cafe library webinar — has encouraged so many librarians to join the online community. Lifetime achievement–Joyce Valenza– NeverEndingSearch — Joyce provides constant leadership, creativity, and support for other librarians, and has been a real leader in edtech for the field, and deserves many kudos! She’s blogged, create wikis galore, led the creation of the TLVirtual Cafe, holds unconferences and constantly asks why and how. She is very deserving of the recognition. Designing a space? First figure out your intentions.